Want to feel what it's like running in the latest and greatest shoes from Asics? Here's your chance to sample the brand new Cumulus v15 and Nimbus v15! 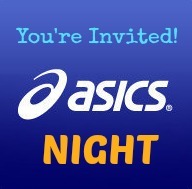 Join us on Wednesday, August 14th for Asics Night sponsored by Asics America and Fleet Feet Sports! All attendees will receive a FREE gift from Asics and be entered into a raffle for some great prizes!